Remember the roasted Thief in The Cook, The Thief, His Wife, and Her Lover… and the drunken prawns in Tampopo? 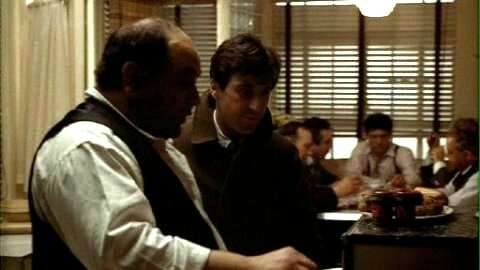 And who could ever banish the memory of five raw eggs chugged in Rocky… or the boiled shoe with the linguini laces in The Gold Rush? And let us not forget the machine-made breakfast and Mr. T. cereal in Pee-Wee’s Big Adventure, or the tropical-fish sushi in A Fish Called Wanda. In some weird way movies and food compliment each other and often lead to some of the more memorable gustatory experiences, so why not curl up with a recipe and a great film tonight. Here are some rather tantalising suggestions to get you started:. Biscotti-encrusted fried green tomatoes with a goat cheese mousse, smoky-flavored corn salsa and a blackened poblano pepper and scallion-spiked cream is the pinnacle – but here’s a lip-smacking and easier to prepare variation: . Soak the tomato slices in the buttermilk for at least 30 minutes. Mix the flour, cornmeal, salt and pepper. Pull the tomato slices out of the buttermilk dredge them in the cornmeal mixture. Fry the tomato slices in oil over medium heat until golden brown on both sides, about 3-4 minute per side. Place slices of cheese on one side of toasted bread. Place in toaster oven or in oven under broiler to melt. 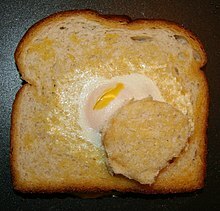 The dish is typically bread with an egg in the center and then cooked with a little butter or oil. To obtain even cooking, the dish is often either covered or flipped while cooking. It is also important not to cook the dish at too high or low a temperature, or the bread may burn before the egg is fully cooked, or vice versa. In honor of the movie staring Julia Roberts, we chose perhaps one of the most famous simple Roman pasta sauces, made with black pepper and aged Pecorino Romano. It is sure to restore your appetite for life! Buon appetito. 1. Bring a 6-qt. pot of salted water to a boil. Add pasta; cook until al dente, 8–10 minutes; reserve 1 cup pasta water and drain pasta. Meanwhile, heat oil in a 12″ skillet over medium heat until shimmering. Add pepper; cook until fragrant, 1–2 minutes. Ladle 3⁄4 cup pasta water into skillet; bring to a boil. Using tongs, transfer pasta to skillet; spread it evenly. Sprinkle 3⁄4 cup each Pecorino Romano and Cacio de Roma over pasta; toss vigorously to combine until sauce is creamy and clings to the pasta without clumping, about 2 minutes, adding some pasta water if necessary. Transfer to 4 plates and sprinkle with remaining Pecorino and more pepper. Pairing Note A medium-bodied sangiovese, like the 2005 Brancaia Tre Toscana ($21), will complement this dish’s peppery notes. This is ramen inspired by the fantastic movie Tampopo (タンポポ）, a classic of both food and Japanese cinema. I made it for my family in recognition of my big move to Japan next month. Here is a clip from the film which I think you might enjoy. Place bones in a pot of water, bring to a boil and cook for 1-2 minutes. Drain and discard the water before rinsing bones under a cold tap. Combine bones with other ingredients and bring to a light simmer (never a boil, or the soup with cloud), keeping going, uncovered, for about seven hours. You will probably need to add a little water to keep your 1-2 inch buffer of water above the bones and other ingredients. Once it’s done, strain it as much as possible, and either use it, keep it on the low fire for a day of running your ramen shop, or cool and refrigerate or freeze it. Brown the pork all over before simmering it over medium-low heat in a mixture of all the other ingredients for 1.5 hours. Let it cool. For classic ramen chasu, all you have to do is let it cool a bit and thinly slice it (about 4mm). The braising liquid is great reserved. Heat bowls and put a few tablespoons of soy sauce (and a dash of the pork braising liquid if you have it) in the bottom of them. Dice the pork (I use thicker than usual slices for this) and quickly stir-fry it with the sliced negi). Meanwhile put the noodles into the boiling water for about 2 minutes and drain. Ladle the broth into the bowls, followed by noodles and the negi/pork mixture. Add menma on the side and finish off with a drop of sesame oil over the pork. Done. Tampopo Special Ramen. Lacking neither substance nor profundity. For more classic shoyu ramen, combine the soy in the bowls with broth, add noodles, serve with a strip of nori, thinly sliced pork, negi, menma and any other toppings you desire.